GHOST AVENUE are a classic Hard Rock and Heavy Metal band, who formed in Norway in 2002, and were formerly known as GHOST. Heavily influenced by “the golden era of the 80’s Hard Rock and Heavy Metal”, the 5-piece incorporates the best aspects of these genres into their own music. Their self-titled release “Ghost Avenue” features distorted riffs, catchy choruses and energetic bass and drums, and is their first album with Pitch Black Records. However, this is by no means their first success as a band, having released several EPs and albums which were very well received both locally and overseas. This 11-track album is likely to be a new favourite for many oldschool Heavy Metal lovers, better find out if you’re one of them. The album kicks off with a title-track, “Ghost Avenue”. It features a multitude of catchy riffs, both melodic and distorted. The vocals by Kim Sandvik are absolutely perfect for the genre, and reminiscent of Ronnie James Dio and other Heavy Metal legends. The following track also contains impressive guitar work at the hands of Øystein Wiik and André Berger, as well as some impressive bass and drumming by Magnus Liseter and Petter Chris Lein respectively. More solemn at times than the opening track, “Rocknroll Tree” has lyrics and talented instrumentation that will steal your attention. Track number three goes in slightly different direction, commencing with a screeching solo, one of many which appear on this album. In saying that, “The Hunt” does not neglect to include the unbelievably funky riffs and vicious vocals which make the band that they are. “Right Direction” is also another direction again, with the song established with rumbly bass and clashing cymbals. The song nears perfection when joined by riffs, and reaches it when Sandvik’s vocals come in. the following track also highlights the awesome sound of Liseter’s bass in the introduction: “Crazy Eyes” has a rhythm that will get your feet tapping against your will, with a hold over you that won’t let go until the song ends. In addition, the backing vocals in this track give it that extra bit of awesome diversity. “Treasure Chest” permits the guitars to reclaim the spotlight in the introduction, but it is the combination of instruments which really make the song. The group has a real talent for creating a powerful energy that is just as strong as if you were listening to them live. As for “All I Can Say”, all I can say is: it’s beautiful. The guitars are melancholic during the first verse, but soon turn up the distortion when they are joined by the drums and bass. Sandvik’s voice is as strong and emotive as ever. Overall, this song is a definite highlight of the album. Next up we have “Out On The Street”, which has a dangerously funky rhythm, including a couple of brutal breakdowns and solos. All instruments are impressive in this one, and it’s the same story in the following three tracks. It’s the same story throughout the album, actually. The next three tracks, “When the Going”, “Legacy” and “Two Drinks” draw the album to a catchy and heavy close, leaving you wishing it didn’t have to end. 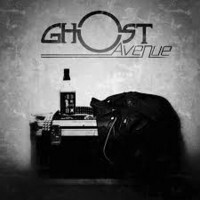 With their distinctive sound and adherence to traditional Heavy Metal, GHOST AVENUE is a band to take note of. Coming from Scandinavia, the Metal capital of the world, it is no surprise that this band is so impressive, and has an immense amount of musical success ahead of them.